A legendary Demon Trapper, Riley Blackthorne frequently battles with Hell's minions. So when she travels to Scotland to meet up with her hunky boyfriend, and celebrate her eighteen birthday, she's thrilled at the chance to leave Atlanta and its troubles behind. Denver Beck, who has been studying for months to become a Grand Master—a rare and highly dangerous job—is just as eager to see his girl. He's anticipating a romantic reunion, keen to take their relationship to the next level. Riley's twisted history with Hell has garnered unwelcome interest by people willing to use her for their own purposes. Trouble is brewing in the land of the heather, the kind that will drive a wedge between her and Beck, and prove the ultimate test of their love...and their survival skills. Jana Oliver doesn't disappoint her fans in the slightest, and Beck and Riley come back in full force to make us dream once more! As usual, it's impossible not to feel involved in whatever this amazing couple gets themselves into, as much as it's impossible not to let their wonderful chemistry carry you away. Even if this is just a novella, there's still plenty of action, mystery and romance to keep your mind occupied and make the journey a very exciting one for both our heroes and us readers. 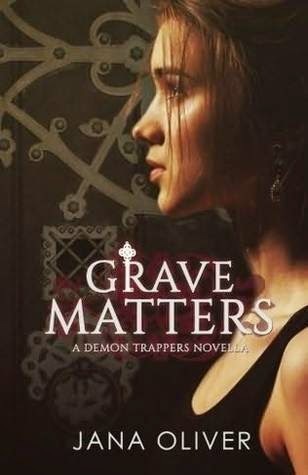 I strongly suggest the read to every Demon Trappers fan. It's not just that the story is really good, but also the bonus scenes at the end and some demon illustrations that add a very nice touch to the whole book! Did you know I made the official book trailer for The Demon Trappers series? and start living one of the most exciting adventures ever!